Approximately every minute of every day, someone in Canada needs blood. That's a shocking statistic, but what does it really mean? Who are all these people that need blood? 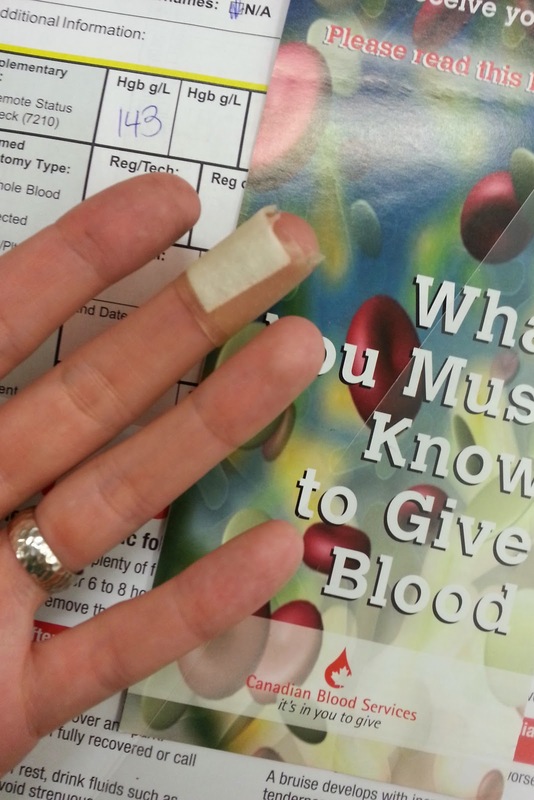 According to a recent poll, 52 per cent of Canadians say they, or a family member, have needed blood or blood products. Reasons for blood transfusion include surgery, car accidents, cancer treatment, leukemia & anemia. Blood transfusions are received by people of all ages, ethnicities & genders, including premature infants. If you stop & think about it for a moment, you probably know a lot of people who've received blood transfusions at some point in their lives. Many people who would likely have died without the blood that another person donated. 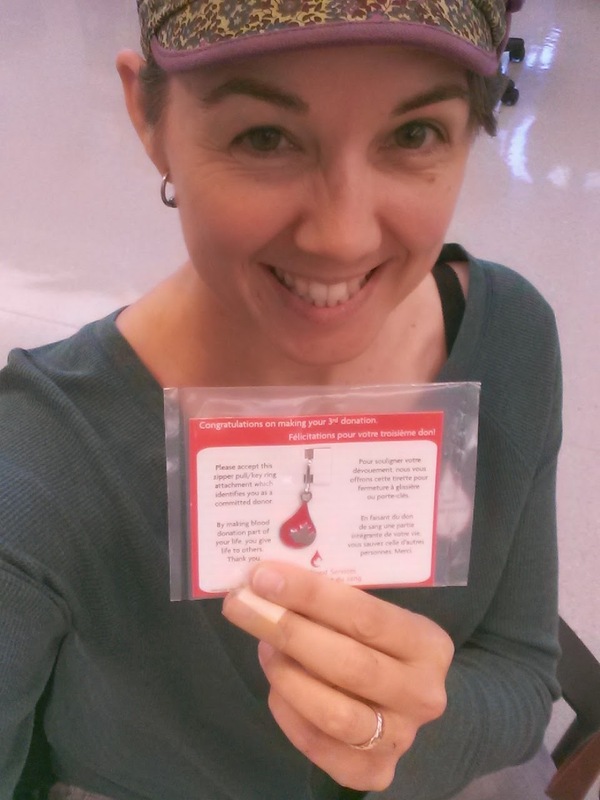 Before I donated, they checked my hemoglobin: all good! You must be at least 17 years of age, in general good health, and feeling well on the day of your donation. You must weigh at least 50 kg (110 lb). The minimum time between blood donations is 56 days (8 weeks). You must have a hemoglobin of at least 125 g/L. I got a zipper pull after my third blood donation. Go to the site, however, because there are a few other restrictions based on where you may have lived or other lifestyle factors (see here for more info). If you are eligible, please call 1-888-2-DONATE (1-888-236-6283) to schedule an appointment to donate at your nearest clinic (or you can do it online here). There are permanent blood donor clinics in Vancouver & Surrey, plus mobile clinics all across the Lower Mainland - you can find one near you at blood.ca. 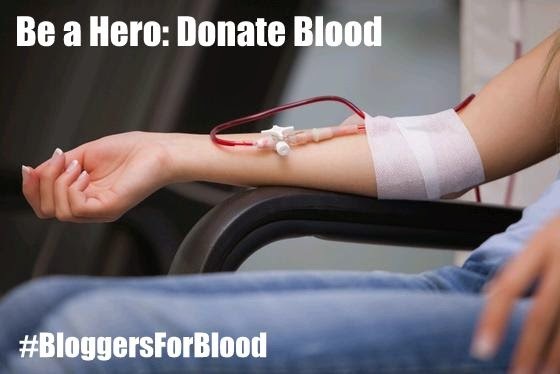 If you are not eligible to donate, please help spread the word (share this post on social media, intiate a conversation on Twitter & use the hashtags #bloggersforblood & #alotoflovesformarilyn, urge your friends in person to donate) or volunteer with Canadian Blood Services. Think about it this way: one blood donation - in just one hour - can save a life. In one hour of your time, you can save someone's life. That makes you a hero. Follow Canadian Blood Services on Twitter, Facebook, & YouTube for more information.